Please scroll down to see if we have answered your questions. Are your vehicle’s pet friendly? We wouldn’t want Snoopy to get car sick however we do allow registered aid animals such as guide dogs on request. Must I have a credit card to rent with you? Yes you will need to have a Visa or MasterCard credit card in order for us to place a hold for any security deposits on the day of collection. Do you accept Diners or American Express credit cards? We do not accept Diners or American express credit cards, we only accept Visa or MasterCard credit cards. How do we pay for our rental? We require a 25% payment to confirm any rental. The 75% balance must be paid two weeks/14 days prior to collection of the vehicle. If you book your vehicle less than two weeks prior to collection we require the full amount to confirm it. Why am I calculating 9 days but you are charging/quoting 10 days? We charge per calendar day meaning each date is a full days charge. Do you provide hotel and airport Transfers? We will pick you up and drop you off free of charge from Hosea Kutako, O.R Tambo and Cape Town International airport, we also offer free transfers from any Hotel, lodge or accommodation within 25km’s of our Windhoek, Cape Town and Johannesburg offices. If your accommodation is more than 25km’s away we will be able to offer you a Transfer at R400.00 each. What is your minimum rental age? 7 days is our minimum but exceptions can be made on request. Where are we allowed to go? We allow travel in South Africa, Namibia, Botswana, Zimbabwe (South of Victoria Falls/ Harare), Zambia (South of Livingstone) and Mozambique (South of Vilanculos) Please see below for more information. Will we be supplied with towels, sleeping bags etc.? Please kindly see the full equipment list sent with your quotation or when selecting the vehicle type on our website. Does the vehicle have a Tow bar? We do not permit towing. Does the vehicle have a snorkel? Some vehicles do but this is for the airflow, our vehicles haven’t gone for swimming lessons yet! 1. Check the depth of the water if possible and the bottom. Is this soft or rocky? Are there any holes that you could get stuck in? 2. Work out a path to follow, If possible watch someone else go first! 3. Reduce tyre pressure for grip. 4. Go in slowly and cross slowly and steadily (less than walking pace) If the water looks like it will be above the wheel hubs consider not crossing at all. 5. Make sure you are in full 4WD. 6. Have your windows down so you can exit the 4x4 if something does go wrong – though you shouldn't be in water anywhere near that deep! 7. Once you are in, accelerate gently and maintain a steady pace to create a bow wave. 8. Avoid changing gear if possible. This can let water into the clutch plates and increase slip. 1. Say you get stuck – this is very, very unlikely if you follow the rules above, but if you do – just keep the engine running. This stops water entering the engine from the exhaust end. 2. If you stall, restart the engine and move on. Sometimes that might mean backing up before going forward again or finding another way. 3. If you do get stuck, say in a hole you can’t get out of, stay with the vehicle and await help. If it’s too much for the vehicle, it’s certainly much too much for you. You will find other people will be generally happy to help out. 4. 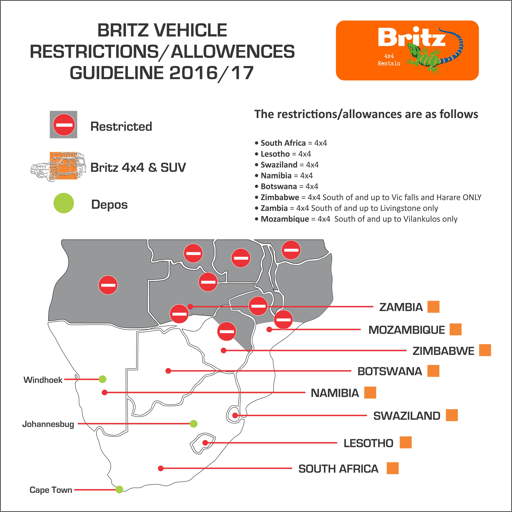 And of course, the Britz team are just a phone call away if you need, and can answer all your questions when you pick up your 4x4 vehicle from us at the start of your trip. Do your LDV’s have long range fuel tanks? Our BT50, Nissan and Toyota Double cabs and single cabs have long range fuel tanks. Do your SUV vehicles have duel batteries? None of these vehicles have two batteries. Do any of your SUV’s have built in GPS systems? Our Renault Duster’s have them built in. Do any of your SUV’s have seven seats? Yes our Nissan X-Trail AT and MT have seven seats as well as our Toyota Fortuner’s. Can we rent a fridge with our vehicle? Unfortunately these vehicles are not equipped to operate our fridges; we suggest you go to any major store and purchase a cooler box that can be plugged into a cigarette lighter port. We only permit towing on our Toyota Fortuner 4x4 vehicles and a towing disclaimer form will need to be signed. Can we have an extra spare wheel? Unfortunately this is not an option. What is the driver’s minimum rental age? 3 days is our minimum rental period. We allow travel in South Africa, Namibia, Botswana, Zimbabwe (South of Victoria Falls/ Harare), Zambia (South of Livingstone) and Mozambique (South of Vilanculos). Please see below for more information. The usage of our 4x4’s is restricted to specific areas within the region. Some countries have no restrictions while others are partially restricted to certain areas outlined below. To request a vehicle, please use our booking form.